Walkout Lake Front Condo In The Park État Calme et proche de tout! Roomie 1 chambre, 1 salle de bain 4 couchages confortablement sur un lit king size dans la chambre principale et un canapé futon dans le salon. Terrasse avec table 4 chaises et un barbecue au gaz donne une vue panoramique sur le lac. Admirez la vue sur un grand espace vert sur le lac et sur les falaises et les arbres de l'ensemble du lac. Cuisine entièrement équipée avec toutes les commodités nécessaires pour de belles vacances inclus. Condo est dans le parc Etat qui fait une grande randonnée pédestre et pistes cyclables, équitation, natation et beaucoup d'animaux à voir. Regarder les bateaux passer ou poisson pas de votre porte. Complexe de condo dispose d'une piscine, aire de jeux pour enfants, une salle d'exercice, et des tables de pique-nique pour manger en plein air. Condo est à 10 min. des commerces et des restaurants, un golf, des théâtres et des arcades à Osage Beach sont à 15 min. Et environ 30 min. aux deux parcs aquatiques intérieurs et extérieurs, Ozark Caverns et Bridal Cave. Ponton & Vague location Runner (Memorial Day-Labor) situé à côté de Park Place Condominiums. 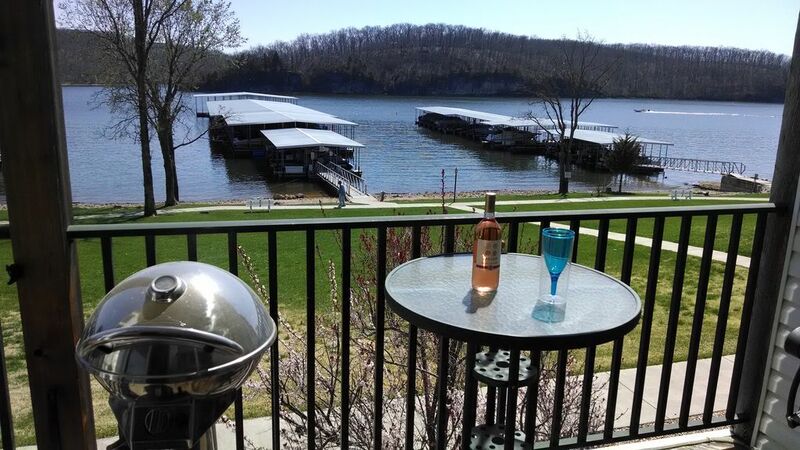 Beautiful condo, breathtaking views and great state park access! This condo was immaculate and clean. We felt right at home from the minute we stepped in the door. The bed and furniture were comfortable and the decor was done tastefully. The kitchen was fully equipped with everything needed to cook meals and had all the modern conveniences . The grounds were maintained with expertise, the lake views were beautiful and the access was convenient. If you’re looking to do anything in the state park this is the place to stay. The only small disappointment we encountered was with the fireplace. We booked this condo specifically because it had a working fireplace. When we arrived we found that it was not functioning properly even after troubleshooting. It was during a change in season so I won’t hold it against the owner in this particular case. My only advice is to inspect/test during season changes to keep user friendly and avoid inconveniences. All in all I would highly recommend this condo for everything it offers and hopefully we will get to stay here again. Thank you for your review and rental! Very nice. Was perfect for 2. Loved the view. More extras than most places we have stayed. Will stay again. Thank you! Glad you had a great time! We look forward to your next stay!! We have stayed in Park Place many times before at other properties. This property was good. It is a one bedroom and I think for two people its good. Four people may get a bit crowded. Needs just a little updating but overall it was good for what we needed. No WiFi was a little hard. Our daughter had a hard time with college homework without it but for a person who wants to disconnect it would be perfect for them. It is a quiet place to stay at the lake. Good fishing from the dock! Thanks for your feedback. It seems that WiFi is coming in the next few months. Thanks again for the rental. We really enjoyed our two nights stay at Kenton's place. The view is beautiful and very peaceful. Just few steps away from fishing dock and got a lot of fishing done. Condo is neat and have everything we need. Kenton is very easy to work with. Thank you for the review! Glad you could enjoy our little piece of paradise!! condo was fine. good location. it was to small for us but that was my fault. owner was very nice and accommodating. we met other family members and spent most of our Time in there condo. only used our condo for sleeping. didn't use the kitchen. Very comfortable place!! Great kitchen supplies available for cooking! Offers a nice pool to swim at and a great view to watch the boats on the water!! Thank you for the rental and review Brenda! Glad you enjoyed our little piece of paradise! We look forward to having you back again! Rates are subject to change until booking is confirmed. Holiday weekend requires a min. of 3 night stay. Must be 23 years old to rent. Sorry NO smoking and NO pets allowed in Condo. Check in is 4:00pm. Check out is 11:00am. VISA, MASTER CARD, DISCOVER ACCEPTED. NO AMERICAN EXPRESS.